This topic describes the Review Pending Changes page and how to selectively deploy individual or multiple tiles in Ops Manager. Deploying tiles selectively can drastically reduce deployment time. The following screenshot shows the Review Pending Changes page. Features called out with red letters are described below. A—Select All Products: When enabled, the checkbox selects all available products. When disabled, the checkbox deselects all available products. B—Select Product: The checkboxes next to each product listing allow you to select the tiles you want to deploy. The BOSH Director is always selected. Green—Tile is configured and ready for deployment. Orange—Tile is not fully configured and cannot be deployed yet. D—Depends on: This section lists tile dependencies and versions. If you choose to deploy a tile that has dependencies, you must also deploy all of that tile’s dependencies in the same deployment. Missing stemcell—You must import and stage a stemcell with Stemcell Library. The warning links to the Stemcell Library. Stemcell out of date—You must update the stemcell of your tile in Stemcell Library. For more information, see Importing and Managing Stemcells. Configuration is incomplete—You must complete the configuration of your tile. Configuration is invalid—You must resolve your tile’s invalid configurations. 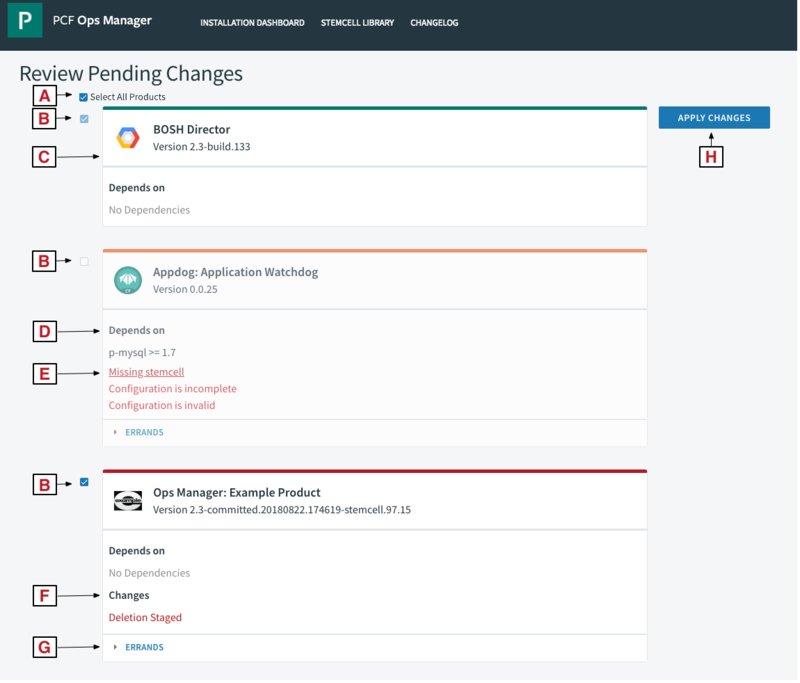 F—Changes: This section lists high-level pending changes to the product that Ops Manager has not yet attempted to deploy. When Ops Manager tries to deploy a product but the deployment fails, it clears this list and the pending changes are retained for the next deployment. To see if your product deployed successfully, see Change Log Page. G—Errands: If you expand this section, you can enable or disable errands that trigger when that tile deploys. For example, you may enable an errand to log properties. For more information, see Managing Errands in Ops Manager. H—Apply Changes: Clicking this button deploys all enabled tiles.